The study has caused some concern. Marine ecologist Lucy Quinn encouraged people who find a dead fulmar on a Scottish beach to make contact with analysts. A study run by Jan Andries van Franeker, at the Wageningen University and Research in the Netherlands, is finding a huge majority of dead fulmars have plastic in their stomachs. In many cases they contain so much plastic in their stomachs, it is the equivalent of the contents of a full lunchbox for a human. 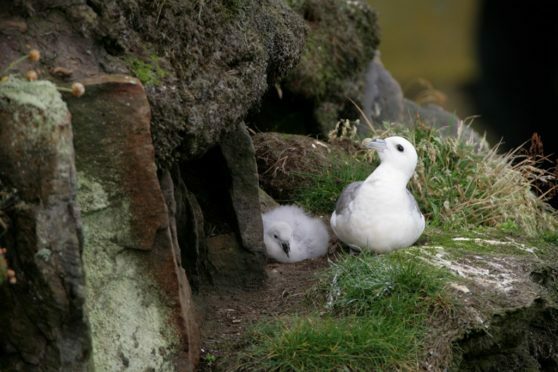 Ms Quinn, who has been involved in the project in Scotland for several years, said: “What the project needs is for people to report if they find a dead fulmar on the beach, so that it can be used for analysis in the project. “It would be great for the public to be aware that if they come across a dead fulmar to get in touch with the project. Members of the public can contact Ewan Edwards on Twitter at @ewaneddy, or through their local marine conservation society or RSPB beach clean contact.